Posted on March 15, 2016. Subscribe to our blog by email. Welcome to the March 2016 issue of the Global Washington newsletter. Water is the lifeblood of thriving communities, essential to health and well-being, and critical to economic development, gender equity and access to education. Without clean water and sanitation, individuals and communities lack resilience against natural and man-made threats. For example, Ethiopia is currently facing one of the worst droughts in decades with nearly 6 million people needing water and sanitation services. Some experts even predict that future wars will be waged due to a lack of access to clean water. The good news is that Washington state is leading the way to increase access to clean water globally. Companies such as Global Good, MSR and PotaVida are providing cutting edge technologies and non-profits such as Water1st, Splash, World Concern and World Vision are getting clean water to the people who need it most. We’ll be shining a spotlight on non-profit and business partnerships at our Clean Water Allies event on March 29. I hope you can join us. We also want to celebrate all of the Global Washington members working on solutions to our world’s most pressing challenges. We hope you will join us in Seattle on May 12 for a Spring Member Celebration. We look forward to honoring the dedication and success of our region’s global development leaders, and I encourage you to come party with us and be a part of this dedicated community that is impacting lives around the world. Does your organization have anything planned for World Water Day next week? If so, please tell us your organization and describe your event! Imagine waking up in the morning and having no water. No water to drink, to brush your teeth, to make breakfast, or even to wash. Instead, the nearest water source is three to four miles away and, if you’re a woman, your family is counting on you to fetch the day’s water. It takes six hours round trip daily to carry water as heavy as 70 pounds, and this keeps you in a perpetual cycle of poverty since you are unable to attend school or gain employment. And your reward for this hard work is water that is filthy, and often makes your family sick. Water is at the core of sustainable development, touching on social, economic and environmental issues. Sustainable Development Goal (SDG) 6 focuses on the entire water cycle including management of water, wastewater and ecosystem resources, and expands upon Millennium Development Goal (MDG) 7 which, prior to 2015, promoted safe drinking water and sanitation. While over 2 billion people gained access to improved drinking water through piped supplies and protected wells since 1990, there are still approximately 748 million people who do not have access to safe drinking water, and some 2.5 billion people who lack access to improved sanitation. As the global economy continues growing, so does the demand for water as well as the amount of pollutants entering potable water sources. Demand for water is projected to rise 55 percent globally, primarily due to manufacturing, thermal electricity and domestic use. More water will also be needed to meet the growing demands for food, as agriculture will need to produce 60 percent more food globally (100 percent more in developing countries) to feed the population. Contamination is an issue that runs parallel to scarcity. The bacteria and parasites in water can lead to communicable diseases such as diarrhea, cholera, dysentery, typhoid and guinea worm infection. Nearly 2.5 billion people practice open defecation near water sources. Even in urban areas, over 2 billion people use toilets that drain raw sewage into open drains or surface waters. Unsafe water and sanitation accounts for 94 percent of deaths due to diarrhea, and kills approximately 180,000 children under the age of five each year. Another 160 million children suffer from chronic malnutrition and stunting, often linked to unsafe water. And illness from dirty water can cause absence from school and work, in turn slowing economic growth. This complex issue certainly allows for much opportunity. So what can be done? SDG 6 sets six targets to be met by 2030, including making safe drinking water for all, creating adequate sanitation (especially for women), minimizing water pollution, increasing water-use efficiency, implementing more effective water resource management and protecting and restoring water-related ecosystems (i.e. rivers, wetlands and aquifers). Accomplishing these goals require the coordination and cooperation of governments, as well as for-profits and non-profits worldwide. Washington state has a number of organizations working on this critical global development issue. Below are descriptions of GlobalWA members who are currently leading water programs and projects throughout the world. Learn more about these members and others on GlobalWA’s interactive map. Photo Credit: Taylor Jashinsky/World Concern. Although there is water available in places like Myanmar, it’s often unsafe to drink. 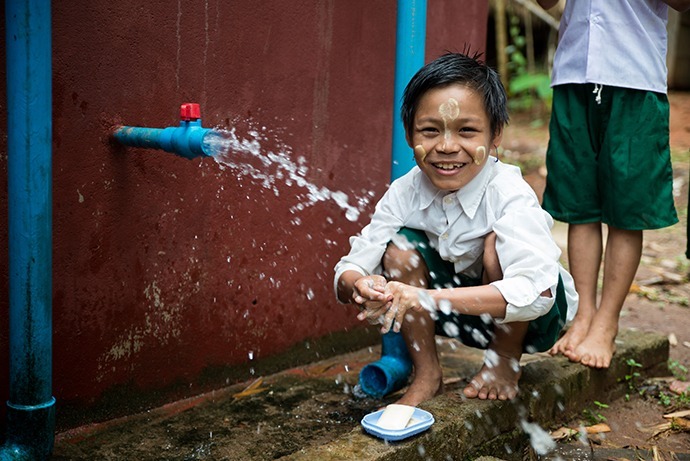 World Concern provides ways for families to have clean, safe drinking water. Successful global development rarely includes one-size-fits-all solutions, and working in clean water and sanitation is no exception. People rebuilding their communities after a disaster strikes may find themselves surrounded by water, with none of it being safe to drink. Even those who have access to purifiers or chlorine tablets may not understand how to use them properly, finding themselves constantly ill. Additionally, in some communities, improved hygiene practices may go against cultural norms and people may not see value in changing their behavior. World Concern, a Christian global relief and development agency with over 60 years of experience assisting the most impoverished communities in the world, understands that community-led and community need-based interventions are at the core of sustainable development. Chris Sheach, Deputy Director of Disaster Response for World Concern, believes his organization’s number one strength is that its projects are directly based on needs identified by each community. Photo Credit: Edwin Kuria/World Concern. 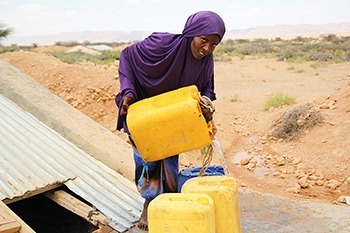 In drought-prone places like northern Somalia, World Concern equips communities to capture rainwater for household use. Successful clean water and sanitation projects must begin with understanding the local community members and what they value. “Program outcomes are tied to value within a community,” said Sheach. For example, in some communities, once a mother understands that clean water and sanitation can help her children live longer, or if a family understands that clean and water and sanitation means less missed work and school days, they are willing to change their behavior. World Concern currently leads clean water and sanitation projects in Kenya, Somalia, Chad, Myanmar, Sri Lanka, Laos and Haiti, and water projects are designed with input and investment from local community members. In Somalia for example, World Concern helped build rainwater catchment systems, and in Haiti helped put a cap on a natural spring to ensure water runoff was free of contaminants and drinkable. World Concern also builds wells and latrines and provides education on how to maintain latrines and practice proper hygiene. World Concern recently announced a collaboration with PotaVida, a Seattle-based company, and the two will be distributing and testing PotaVida’s Smart Solar Purifier in Haiti. Sheach said the purifier is designed for people living in transit, and Haiti was chosen as a pilot for the $150K grant awarded by the Washington Global Health Alliance (WGHA) because many Haitians have been displaced after being deported from the bordering Dominican Republic. Photo Credit: Martha Snowbarger/World Concern. In Haiti, World Concern helps communities access permanent water points. The Smart Solar Purifier will help ensure displaced families in Haiti also have safe drinking water. PotaVida’s Smart Solar Purifier is a 10-liter hydration reservoir with an integrated UV dose sensor, enabling it to disinfect water using sunlight. The Smart Solar Purifier is easy to use, starting at the press of a button and indicating completion with a green light. It is reusable for up to a year, and does not rely upon replacement chemicals, freeing World Concern from supply chain management. What is truly innovative, and one of the reasons World Concern is using the Smart Solar Purifier, is that every unit records usage data. The usage data can then be easily collected using an Android phone, tagged with a GPS location, synced to a database in the cloud, and then accessed from anywhere. Providing these purifiers to people in a transitory situation will alleviate one burden as they work to rebuild their lives, said Sheach. “For us, what will be a success (of this pilot) is if we are able to more accurately determine people’s water usage,” explained Sheach. With the data collected from the purifiers, World Concern will gain knowledge about the communities it works in, allowing the organization to target water interventions to individuals who need them most. Sheach stressed the value of the tight-knit global development community in Washington state, saying the collaboration with PotaVida would not have happened if both World Concern and PotaVida were not located in Seattle. “The community is very connected here,” said Sheach. He believes that organizations like Global Washington and WGHA support, promote, and strengthen partnerships between NGOs, companies and academia within the state, and he’s grateful for that. If there was a recipe of life experiences that would make a respected leader in the clean water and sanitation field, it might look something like this: being raised in Southern Arizona, vacationing in Mexico as a young girl and watching girls your age collect and carry water, receiving degrees in civil and environmental engineering, and founding two non-profits that fund water projects worldwide. 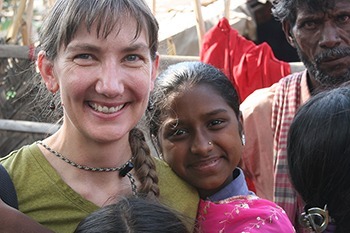 These life experiences belong to Marla Smith-Nilson, Founder and Executive Director of Water1st International, and recipient of the 2015 World Citizen Award. Smith-Nilson believes you can’t grow up in a desert without understanding the importance of water. But it wasn’t until she watched women and girls carry water in Mexico, and then traveled through Egypt and Turkey as a University of Arizona Flinn Scholar, that she truly discovered her passion. “I saw people carrying water and I just said ‘this is it, I have to figure this out,’” Smith-Nilson explained. Smith-Nilson enjoyed studying civil engineering as an undergraduate and environmental engineering as a graduate student and thinks this education has been helpful in providing both her and her organizations with credibility. She believes her engineering training taught her how to solve problems most effectively, as well as how to recognize the limits of her expertise. 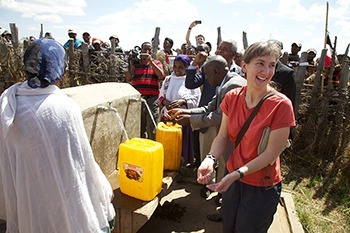 “I discovered early on in my path to this career that if I wanted to help poor people have permanent sustainable access to water, it had to be through support of local organizations,” Smith-Nilson said. In 1990, while attending graduate school at the University of North Carolina at Chapel Hill, Smith Nilson co-founded WaterPartners International (today called Water.org). Her initial goal was to fund one organization in Honduras — COCEPRADIL (Central Committee for Water and Comprehensive Development Projects in Lempira). COCEPRADIL was implementing well-constructed pipe water systems and toilets in rural communities, and was doing everything right in Smith-Nilson’s view. Water1st continues to fund COCEPRADIL today. “I guess, in the beginning, I did not think of it as starting a non-profit,” said Smith-Nilson. “I just wanted to support this group that was doing really good work.” She said, however, she discovered early on that incorporating her organization as a non-profit would help raise more money. 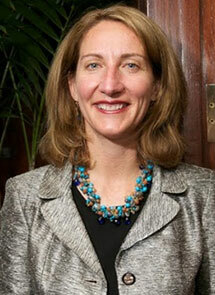 In 2005, Smith-Nilson decided to leave WaterPartners and start Water1st International, based in Seattle. She made the decision to leave WaterPartners because the organization had moved away from grassroots funding. Large funders, such as USAID and the World Bank, had restrictions that dictated where the organization could work, and whom it could work with, explained Smith-Nilson. “I was feeling pretty uncomfortable with the funds we were raising and the direction it was taking us,” Smith-Nilson said. “I wanted to tell donors that money was going to projects that would last a lifetime, and I was not feeling confident that was the case.” With Water1st, she could set project standards to align with best practice. Smith-Nilson enjoyed working with grassroots funders, not only because of fewer funding restrictions, but also because she could directly connect individual donors with people doing good work. “The beauty of starting Water1st was to say ‘these are our standards, and we won’t let go of them ever,’” explained Smith-Nilson. “I feel really good that 11 years later we have maintained the same ideals and standards.” Water1st operates primarily on individual donations, and it partners long-term with local organizations abroad. Smith-Nilson believes when an organization constantly worries about their next funding source, it often makes project success difficult. She explained that, in the water and sanitation sector, 35 to 50 percent of all projects fail in the first two to five years, and this failure rate is unchanged since the late 1980s. Smith-Nilson said sustainable funding from unrestrictive sources has allowed Water1st to work with the same local organizations over the past 11 years. These relationships help organizations make long-term plans, incorporate evaluation into its projects, and retain valuable staff. Smith-Nilson believes, through building sustainable relationships with donors, local organizations vastly improve the efficiency and effectiveness of their projects. 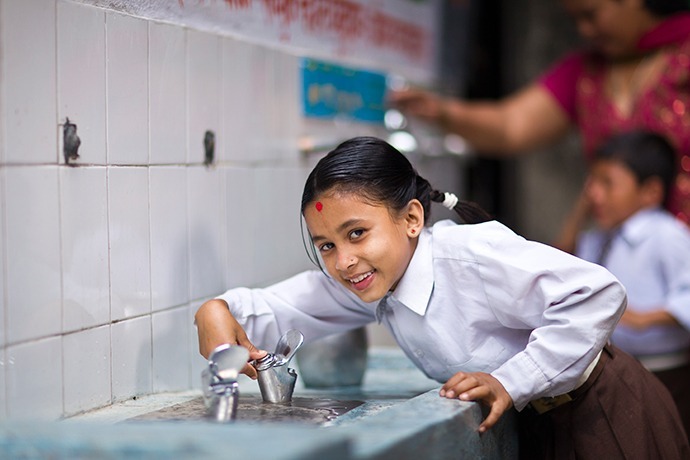 Since 2005, Water1st has completed 1,562 water projects – and not one has failed.